On a recent edition of his radio show, beloved dandy Jonathan Ross said , “If your son asks for a Hannah Montana MP3 player, you might want to already think about putting him down for adoption before he brings his… erm… partner home”. It’s just a joke. I understand that. Jonathan Ross is a funny man and a great TV and radio host, and occasionally his humour is a little risqué. But he’s not Jim Davidson. He’s not one of these repugnant old-guard comedians who like to make jokes about ‘pakis’ and beating women. A joke suggesting that parents should put gay children up for adoption belongs firmly on that side of the line. It’s not a joke at the expense of bigotry; it’s a joke for bigots. The joke is not, ‘people say dumb things about effeminate boys’. The joke is, ‘effeminate boys are bad children’. 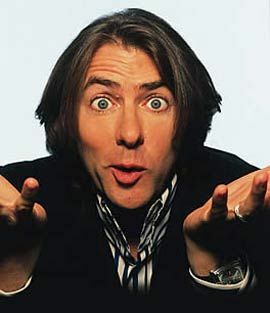 I fully accept that Jonathan Ross is not homophobic. He has demonstrated this time and again. But what he said was homophobic. It was a lazy joke leaning on old prejudices, which perpetuated a message that isolates and alienates children struggling with their sexual identity. No kid wants to be told that his parents should give him away. What Ross seems to have missed is that you can be gay friendly in spirit, and still say obscenely homophobic things. Some of his best relatives are gay! And he’s not just sorry you were offended; he’s sorry that you’re so easy to offend! It’s wretched, craven, snivelling stuff. Bernard Manning could not have put it better himself. The twittered defence actually offends me more than the initial joke. Over on EW.com, Michael Slezak has called on Ryan Seacrest and Simon Cowell to stop exchanging homophobic barbs on American Idol. I actually think they have muted their homophobia this season, possibly because Adam Lambert is on that stage, but their enthusiasm for catty ‘U R gay’ exchanges has been very notable in the past, and it’s disturbing for a top-rated family show to revel in perpetuating the idea that gay=bad. Slezak mentions the recent suicide of a boy bullied at school because classmates assumed he was gay. That’s the collateral damage here. Carl Walker was eleven years old, and he took his own life because we live in a world where TV and radio hosts think it’s fine to rely on lazy gay jokes just so long as they themselves can insist that they are not homophobic. It’s fine to make gay kids hate themselves, just so long as they know a gay person! Ross has been crucified in the tabloids for saying stupid things before, and it was tedious and it was overblown. I’m not interested in repeating that misadventure. I’d just like an apology, and I’d like him and others like him to make the effort not to do it again. I’m not saying that all gay jokes are off limits. I’m saying, don’t go telling gay kids that they are worth less because they’re gay.